Hibs Ladies striker Lizzie Arnot says her side will need to go one better the next time they tackle Glasgow City if they are to be crowned champions. 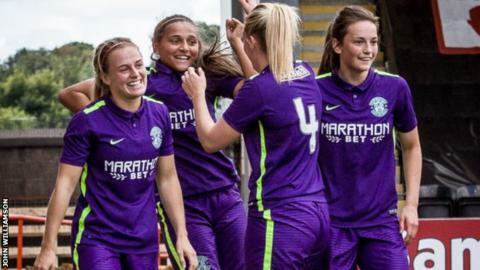 The two are tied on 38 points in the Scottish Women's Premier League after Hibs fought back to salvage a point in Sunday's thrilling 3-3 draw. "It's good to that we know we can come back," Arnot, 19, told BBC Scotland. "However, next time a draw won't be good enough, we'll need to get that win." Hibs were ahead at half-time after Abigail Harrison struck twice following Denise O'Sullivan's early opener. City turned the game around through goals from Nicola Doherty and Lauren McMurchie and thought they had done enough to secure the three points. However, Hibs showed the same tenacious attitude they have displayed all season, fighting back with Harrison completing her hat-trick in the dying moments of the game. "It was obviously an exciting game, especially for the fans," said Arnot. "It would have been good to get the win, but because of the circumstances, the fact that we were ahead to then go behind, to get back in the last minute was rewarding." It was the second 3-3 draw between the two sides this season after Cheryl McCulloch's own goal gave Hibs a point in May. With the champions boasting a better goal difference, Arnot fears simply matching them when they meet again on 4 October may not be enough if they are to become the first team in nine years to stop City winning the league. "Both times we have been ahead, so next time we will need to work on keeping the lead and trying not to lose it," she said. "Obviously we have been working on how to help us win, it's the best chance that we've had to try and beat them and we're still in with a chance to win the league." The match in October is likely to decide the destination of the championship, while the Edinburgh club are also set to join City in next season's Champions League after Scotland was awarded an extra place. "It's exciting," she said. "It's good that we're finally challenging them and it's better for the league as well and for the standard in Scotland. It will raise our game as a whole, which is good. "It (Europe) is obviously massive, everyone is looking forward to the chance and hopefully we come first and not second." Arnot is one of a number of Hibs players who have recently broken into the Scotland squad ahead of the Euro 2017 qualifying campaign, which begins next month. She said: "It's good to be involved in the Scotland squad; it's a high standard, so it helps to raise your game."